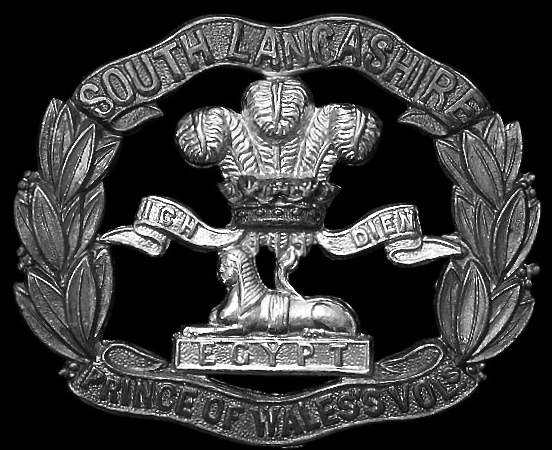 The cap badge of the South Lancashire Regiment. "Our August Bank Holiday jaunt was the first piece of training for a draft who had joined us, fresh from England a few days before. We were amazed at the way these newcomers stood up to the strain and they proved a very valuable addition to our strength. Among the new arrivals sent to my platoon were the Dennett twins. They were short and thick-set, with very fair hair, pink faces and blue eyes and they were absolutely identical; there was literally no way of telling which was which and, as they were devoted to one another, nobody suggested that they should be parted. Their home town was Warrington. They were a perpetual source of amusement and I was delighted to have them in my platoon." This is how Lieutenant Philip Stibbe remembered the arrival of Ptes. 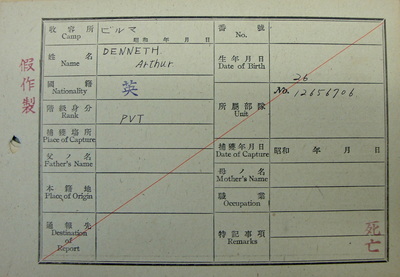 Arthur and Thomas Dennett in his book, 'Return via Rangoon'. 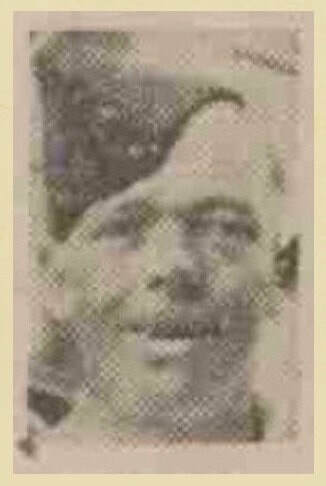 The brothers had served previously with the South Lancashire Regiment and had been posted to the 13th King's as reinforcements from the Deolali Army Centre on the 31st July 1942. 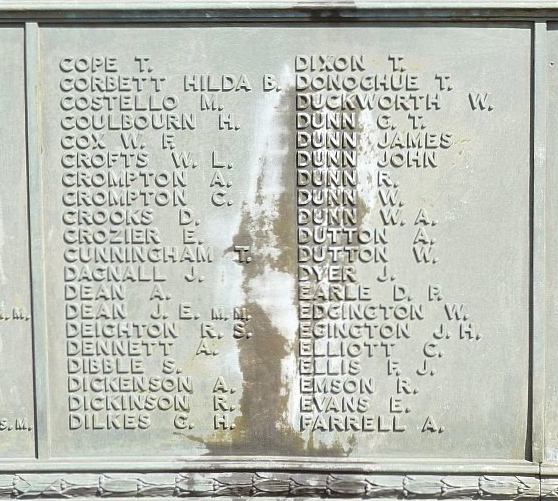 Arthur and Thomas were the sons George and Ada Dennett, of 52 Turner Street in Warrington. George was a railway 'shunter' by trade and according to the 1911 Census, he and Ada had a growing family of five children by this time. It is possible that in the intervening period before the birth of their twins in 1917 they would have had more children, so the twins must have grown up in a very large and loving family environment. After arriving at the Chindit training camp in Saugor in 1942, the twins were placed into Column 5 and as stated by Philip Stibbe were kept together in the first instance in his own unit, Rifle Platoon 7. It is clear from Stibbe's description that the brothers were truly identical and that their fellow Chindit comrades could never really be sure which was which, and that this caused quite a bit of confusion at times. As one would imagine the brothers themselves were inseparable and rarely left each others side. "There was some last-minute juggling with N.C.O's. among the Rifle Platoons. At one time I nearly managed to get hold of Sergeant Thornburrow's bosom pal, Sergeant Rothwell, as an additional sergeant, but unfortunately John Kerr had his eye on him. For a few days I did have Sergeant Drummond and Sergeant Wray, both excellent men, in my platoon, but even I could not think of a convincing argument for having three sergeants. I was particularly sorry to lose Drummond as he had been with me as a Corporal since Patharia, but he fully deserved his promotion and made a first-rate platoon sergeant in another platoon. My efforts to collect N.C.O's. produced much ribald comment from the other platoon commanders, as also did the size of my platoon headquarters. I always insisted that at the end of a long march it was essential for me to have a batman to cook my meal, a runner to take messages, and a groom to look after my horse, in order that I might be free to go to Column Head Quarters for orders or do whatever else was necessary. I stuck to my guns on this point and in the end my platoon headquarters consisted of Sergeant Thornburrow, Dunn, my batman, Feeney, a stout Irishman, as my runner, and one of the Dennett twins as my groom. The other twin was groom to Denny Sharp. They all worked well together and gave me great loyalty and support. This arrangement of the Dennetts was really a compromise. On the Jhansi scheme both of them had been in my platoon. One of them had been detached to stay behind and deal with a mule that was giving trouble and at the next halt we found that the other twin had disappeared as well. Nobody doubted for a moment where he was and the pair of them turned up in Jhansi, triumphantly leading the mule soon after we had arrived there. In order to prevent a repetition of this and at the same time not separate them completely, they were both given jobs as grooms, which they did very well." From that moment on and once inside Burma, Arthur Dennett remained in Stibbe's platoon as the Lieutenant's groom, looking after his horse, which Arthur had christened 'Billy'. Thomas Dennett moved over to Column Head Quarters and became groom to Flight Lieutenant Denny Sharp, the RAF liaison officer. This would mean that Thomas was for the most part, at the vanguard of the column as it marched through the jungles of Burma in 1943, with his brother often bringing up the rear, when Platoon 7 acted as column rearguard. However, the twins were always able to catch up with one another at the column bivouac each evening. Column 5's pathway from the supply drop at Baw to the village of Hintha. 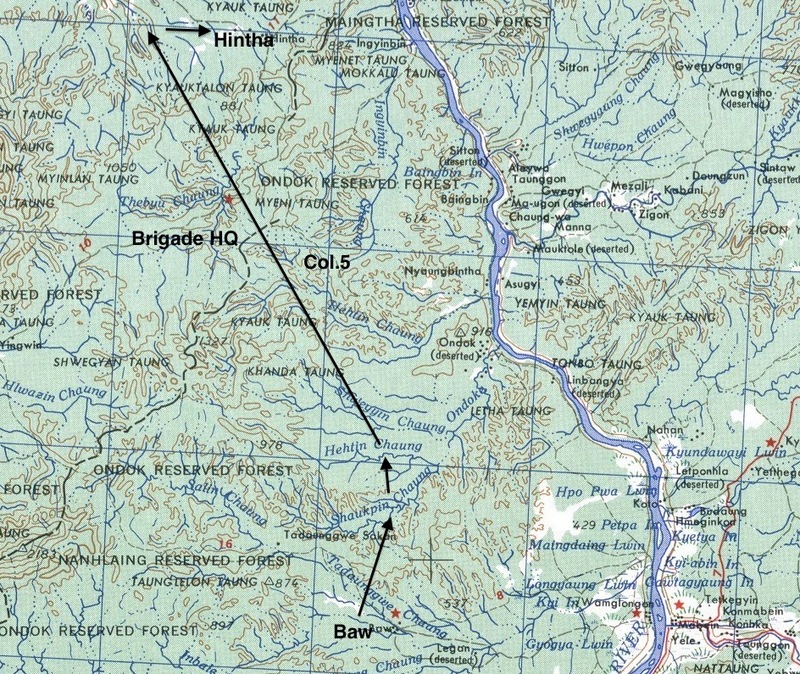 All had gone to plan for Column 5 during the early weeks of Operation Longcloth, they had achieved their major goal of destroying the railway bridge at Bonchaung Gorge on the March 6th, and had now re-joined the Northern Brigade as it prepared to exit Burma. Wingate and Columns 7 and 8 moved off towards the Irrawaddy River with a view to re-cross westward near a village called Inywa. 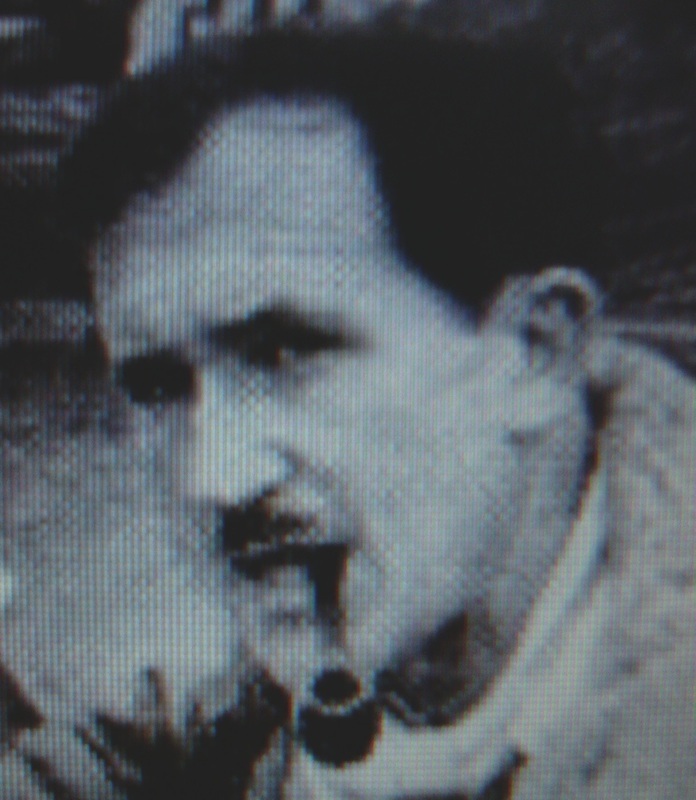 The Brigadier gave Column 5 the job of decoy and ordered Bernard Fergusson to lead any pursuing Japanese in the opposite direction. By the 28th March the column was on the outskirts of a village named Hintha (please see the map above, click to enlarge) and it was here that things began to unravel. Flight-Lieutenant Denny Sharp had been given the task of leading the non-combatants away from Hintha earlier in the evening and this group would have included both the Dennett boys, who would have been stationed outside the village looking after their respective animals. As Sharp's group moved away from Hintha it was ambushed a few miles outside the village by another Japanese patrol, causing approximately 100 men to become separated from the main body. It seems likely that Thomas Dennett would have been at the front of the column, leading his horse and marching alongside Denny Sharp. Arthur Dennett was unfortunately much further back and was with the group of men cut-off by the enemy ambush. "I was with number five Column of the 77th Indian Infantry Brigade, during operations in Burma in 1943. The British Other Ranks mentioned were in my dispersal group all the way through the campaign until we made contact with the enemy in a village in Burma called Hintha. After the action in that village was over, these soldiers were still in my dispersal group, which was then commanded by Flight Lieutenant Sharp of the RAF. We halted and unsaddled our mules so we could go ahead much quicker. After starting off from that halt, which was approximately 2 miles from Hintha, we were attacked by a Japanese patrol. This caused a gap in the column, but we kept marching for approximately another 4 miles and then stopped, we waited for these people to catch up, but they must have gone wrong way, because they did not rejoin us again. I saw all these men for the last time approximately two and a half miles north east of Hintha. They were all alive, and last seen on 28th March 1943." The evening of the 28th March 1943 was the last time that Thomas Dennett saw his twin brother. Flight-Lieutenant Sharp and his party eventually made it back to India about four weeks after the ambush outside Hintha, it must be presumed that Arthur was amongst this group. The men cut adrift by the ambush had been forced to turn eastward and began to reach the banks of the Shweli River (see map above) in penny-packets over the next few days. By great fortune the majority of theses men bumped into Column 7 under the command of Major Kenneth Gilkes, as they prepared to cross the river and attempt to exit Burma via the Chinese Yunnan Borders. Gilkes took the ailing Chindits from Column 5 under his wing and divided them amongst his already pre-arranged dispersal groups. Column 7 had only just reached the Shweli River themselves; the attempted crossing of the Irrawaddy at Inywa on the 29th March had turned out to be a disaster, when the leading boats were attacked by enemy machine gun and mortar fire. Wingate abandoned the crossing and ordered Northern Group to break up and disperse in different directions, Major Gilkes had always considered the route out via China to be his preferred option and decided to follow through with this choice of escape. 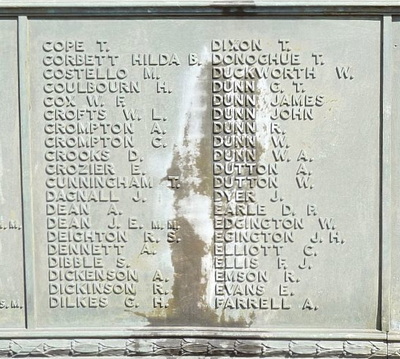 Arthur Dennett was one of the men from Column 5 allocated to the dispersal party of Lieutenant Jon Musgrave-Wood, formerly of the Sherwood Foresters. Coincidentally, this group of thirty-five soldiers also featured my own grandfather, who had also been separated from Denny Sharp's group after the ambush outside Hintha. 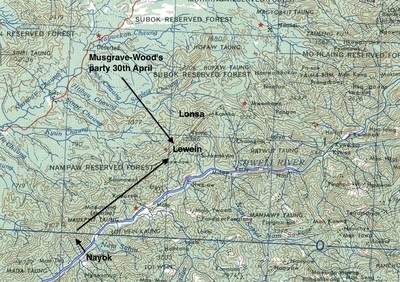 Musgrave-Wood's dispersal group headed south, keeping the Shweli on their left hand side, until they reached the town of Myitson (see map below), here they turned sharp left where the river meandered eastwards. On the 14th April they found the river less formidable and finally crossed the Shweli near the village of Nayok. They shared this crossing with the dispersal party of Lieutenant Campbell-Paterson, formerly of the Royal Scots. 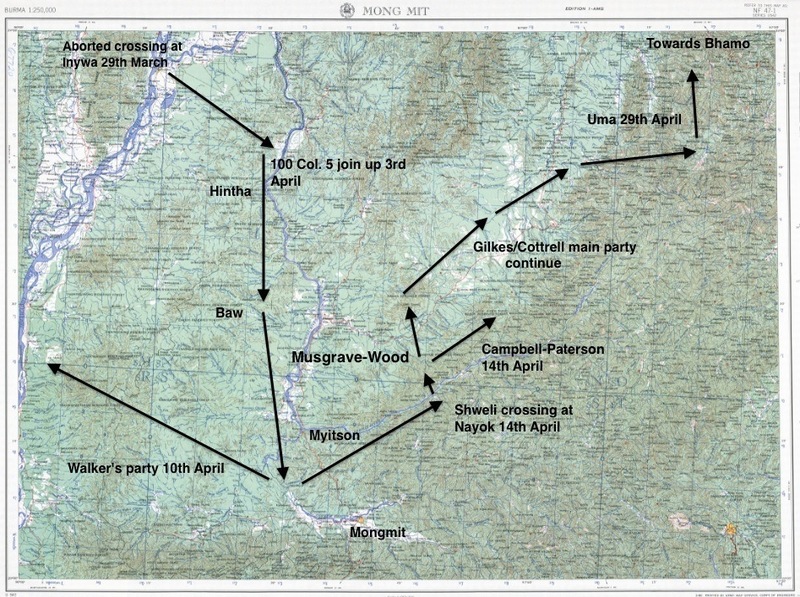 Seen below is a map showing the journey of Lieutenant Musgrave-Wood and his dispersal party from the crossing of the Shweli River at Nayok on the 14th April, until the group reached Lewein on the 30th. 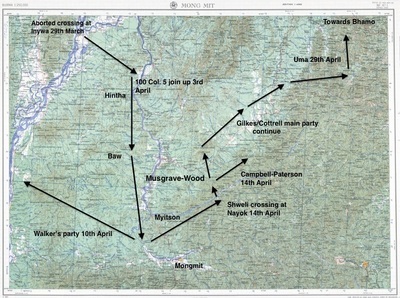 Also featured is a more detailed map showing Column 7's general dispersal pathway, from the failed crossing at the Irrawaddy on 29th March, including the point at which they picked up the 100 lost men from Column 5 and up until the main body of the column closed in on the Yunnan Borders on the 29th April. Please click on any image to bring it forward on the page. Soon after the dispersal parties of Lieutenants Musgrave-Wood and Campbell-Paterson had crossed the River Shweli at Nayok, they ran into enemy patrols and had to lie low in the surrounding scrub-jungle for several days. Finding food and water was becoming an issue for the now exhausted and desperate Chindits, the two groups realised that they would be better off apart and separated not long after. Lieutenant Campbell-Paterson's group did not fair well, with most men, including their leader being captured by the Japanese and becoming prisoners of war. 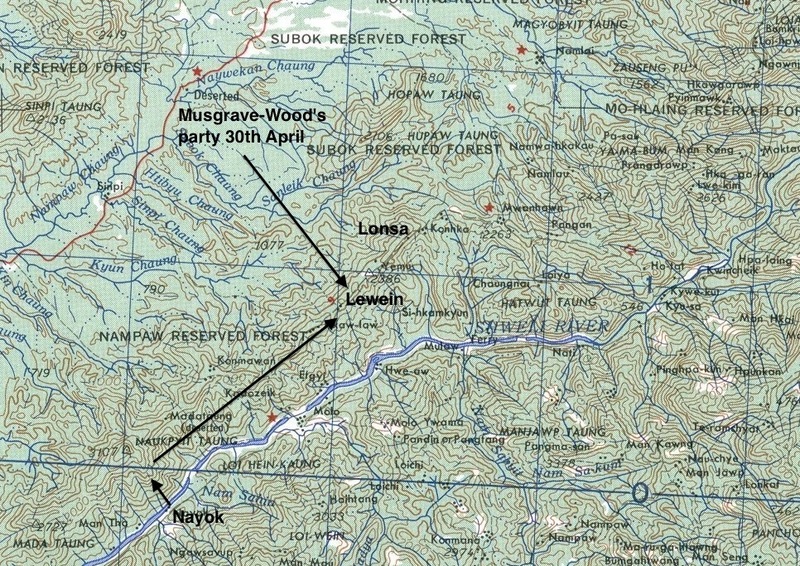 Arthur Dennett and the other men with Lieutenant Musgrave-Wood spent the next week or so moving around the area close to the villages of Lewein, Lonsa and Konkha (see above maps). They managed to find food in these villages, but help was not given freely by the villagers, who now feared Japanese reprisals for aiding the British soldiers. During the latter days of April the party was close to the village of Lewein when it was ambushed by a Japanese patrol. It was at this point that Arthur Dennett and four other men became separated from the main group. 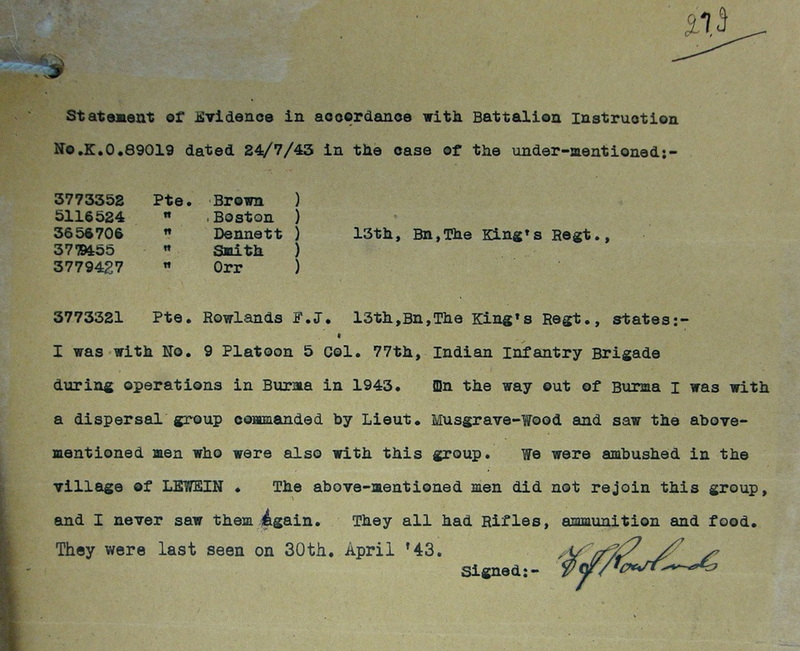 This information was given to the Army Investigation Bureau by Pte. F. J. Rowlands, who was a member of the dispersal party commanded by Lieutenant Musgrave-Wood in 1943. NB. Pte. 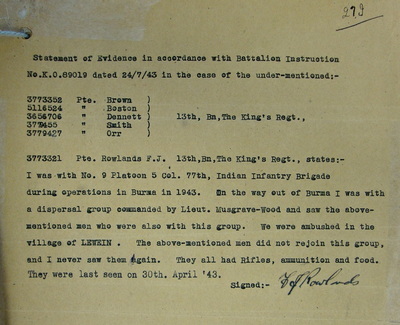 Rowlands' recollection of the 30th April as the date of the ambush at Lewein is probably incorrect. The incident would have occurred approximately one week earlier, however, given that Rowlands still had another eight weeks of arduous marching before he finally reached safety in 1943, I think his error can be forgiven. He was a member of the small party of men led by Lieutenant Musgrave-Wood which reached the safety of Allied held territory in late June. "The order came from Wingate that we were to split up into small groups, so the column split up into platoon strength, approximately thirty men. I was with a group under a Lieutenant from the Sherwood Forrester's and we decided to make our way north to Fort Hertz which was still, of course, in British hands. The idea was that we would take some guides from a village, who would then guide us on to the next village and so on in stepping stones. The Japanese had spotted us but we hoped if we were quiet enough they might go away. One or our chaps, one of the Dennett twins, and for no apparent reason because we already had this knowledge, shouted "Japs". That gave our position away and they started to open fire at us. We literally rolled down the hill. We didn't run, we just rolled or whatever to get to the bottom or the hill. We did everything we could to put our pursuers off the track. We crossed and re-crossed rivers. We could hear dogs in the distance. They used dogs to track us. Eventually we eluded them but we realised that the game was up." Arthur Dennett, Herbert Boston, Thomas Brown and William Smith were all eventually captured by the Japanese after the ambush at Lewein. 3779427 Pte. 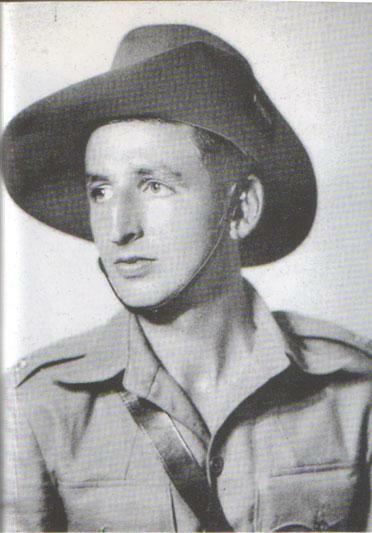 William Henry Orr, a muleteer with Column 5 on Operation Longcloth was last seen on the 1st May 1943, he was reportedly attempting to re-join the main body of Column 7 and had been complaining of a bad heart at that time, although his actual cause of death is still unknown. 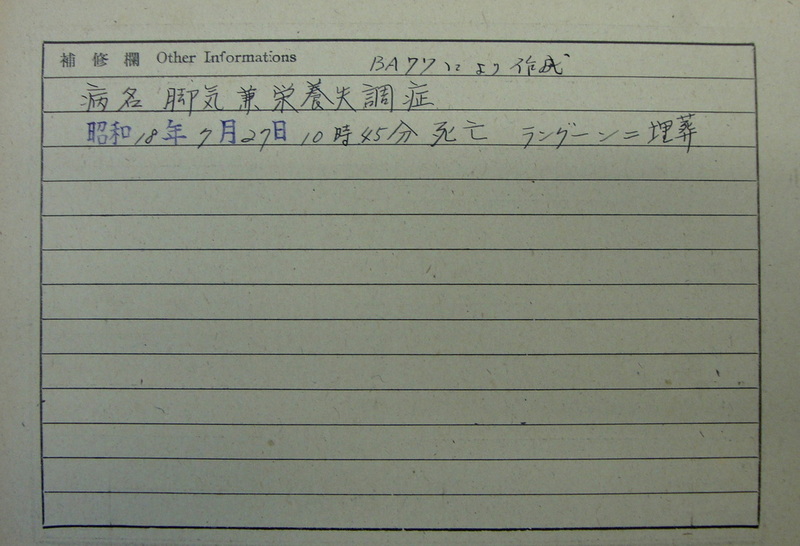 With information taken from various documents relating to prisoners held by the Japanese during WW2; items such as a prisoner's POW index card and the list of deaths for Block 6 of Rangoon Jail, seen below is the fate of each of the men listed by Pte. Rowlands as having been lost during the ambush at Lewein. 3656706 Pte. Arthur Dennett. Died inside Block 6 of Rangoon Jail on the 27th July 1943, with the POW number 431. According to his POW index card, Arthur died from exhaustion and the complications to his health caused by the disease of beri beri. He was originally buried in the English Cantonment Cemetery situated in the eastern sector of the city, close to the Royal Lakes. After the war, the Imperial Graves Commission moved all the burials from this cemetery over to the newly constructed Rangoon War Cemetery. 3779455 Pte. William Smith. Died inside Block 6 of Rangoon Jail on the 4th October 1943. 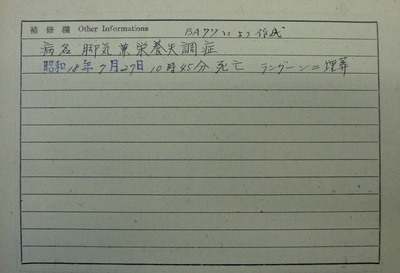 William was given the POW number 425 and like all other prisoners, had to recite this number in Japanese at the morning and evening roll calls. Pte. Smith was an original member of the 13th King's that travelled to India aboard the troopship 'Oronsay' on the 8th December 1941. Unfortunately, there are no other details in relation to his sad demise inside Rangoon Jail, although we do know that he was also buried in the first instance at the English Cantonment Cemetery, before being moved to Rangoon War Cemetery after the war. 5116524 Pte. Herbert Horatio Boston. Died inside Block 6 of Rangoon Jail on the 7th August 1943, also suffering from the effects of the disease beri beri. Herbert, who was issued with the POW number 524, was from Heath Hayes in Staffordshire and was originally enlisted into the Royal Warwickshire Regiment, before being transferred to the 13th King's on the 26th September 1942. 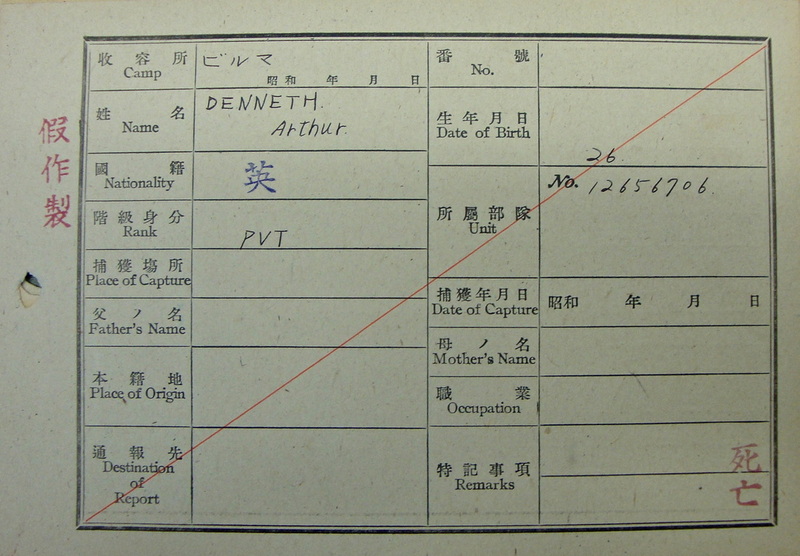 Although he perished in Block 6 of the prison, Herbert does not have a memorial grave plaque in Rangoon War Cemetery. He is remembered instead upon Face 5 of the Rangoon Memorial at Taukkyan War Cemetery, situated on the northern outskirts of the city. It is possible that he was buried alongside his Chindit comrades in the English Cantonment Cemetery, but that any details or location of his grave were lost and so his remains could not be accurately identified. 3773352 Pte. Thomas Brown. Died inside Block 6 of Rangoon Jail on the 11th August 1944. Thomas, who was 35 years old when he perished in the prison had managed to survive for just over one year, before he too succumbed to the disease beri beri combined with the added complication of colitis. Pte. Brown was from Huyton in Liverpool and was another original member of the 13th Battalion. 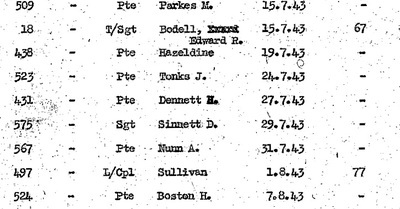 According to his index card, Thomas' POW number was 309 and it states that he was captured on the 24th April 1943. He was buried at the English Cantonment Cemetery and his grave number was recorded as 199. 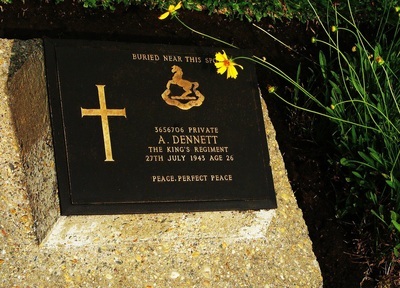 In concluding this sad story, seen in the gallery below are various images in relation to Pte. 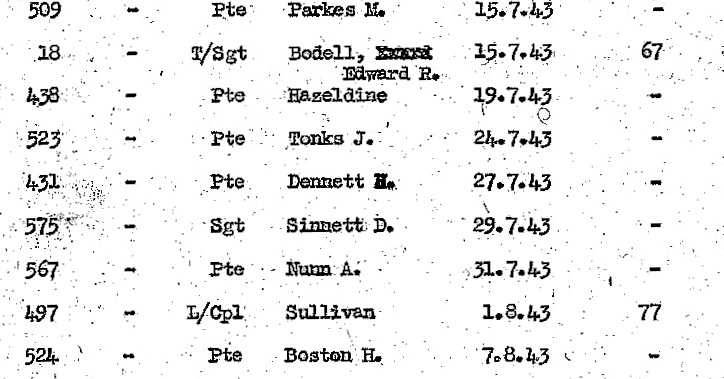 Arthur Dennett and his time as a Chindit in 1943. Please click on any image to bring it forward on the page. Thomas Dennett passed away in March 1964 aged 46 years. I wonder how often he thought about his twin brother Arthur during those intervening 20 years and how much this heartbreak contributed to his own sad passing. Copyright © Steve Fogden, February 2015.